For the zoodles, trim the end off the zucchini and use a spiralizer to create zucchini noodles. Zest lime and juice. Thinly slice chili pepper, peel garlic and ginger, and chop roasted peanuts and cilantro. Heat some toasted sesame oil in a frying pan and fry the zoodles for approx. 10 min, tossing often. Season with salt and pepper, then set aside. In a second frying pan, heat some toasted sesame oil and fry shrimp on medium-high heat for approx. 3 min. or until cooked through. Season with salt and pepper and toss in sweet chili sauce. Add peanut butter, coconut milk, soy sauce, toasted sesame oil, lime zest and juice, ginger, garlic, and water to a food processor and pulse to a smooth sauce. Add the sauce to the pan with the zoodles and toss to combine. 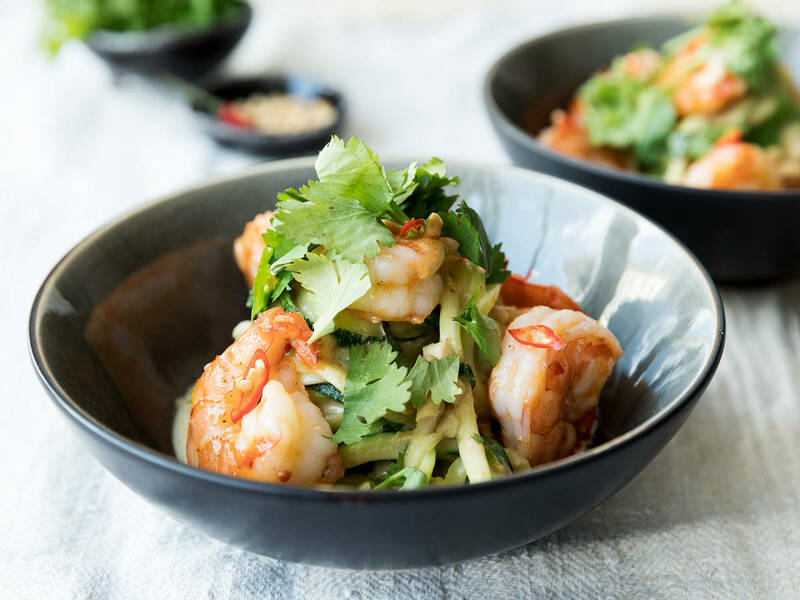 Serve with shrimp and top with roasted peanuts, cilantro, and chili pepper. Enjoy!